Collection Item 3: The Society of the Mechanical Sun Photograph. 1882. 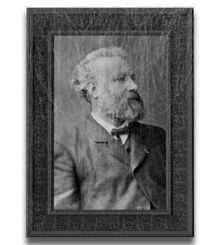 On 9 January, 1882, the Society of the Mechanical Sun was established in a private room in London's famed Scientia Club. 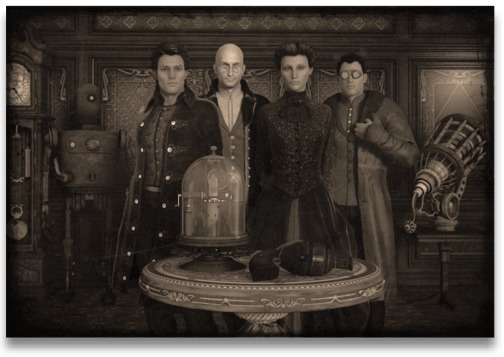 On that auspicious occasion, charter members Geoffrey Hawkins, Berkley Vanderzee, Falynne Hyperion and Timothy Deakin took a moment to pose for a photograph, staged by Deakin's older brother Robert. 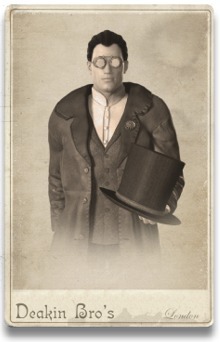 A copy of that photograph was discovered within the Hawkins Strongbox and has been classified as Collection Item 3. It was inscribed on the back with the aforementioned date and the notation, "My colleagues and I travel into the future every day. It is a wondrous, but sometimes dangerous place." 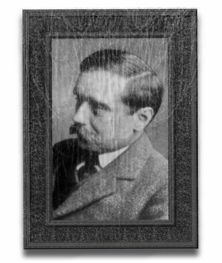 The handwriting has been identified as that of Geoffrey Hawkins. According to Victorian Mechanical Museum archivist Archer Bowens, the photograph is significant for other reasons beyond its four prominent human subjects. On the table in forefront of the image is an early prototype of a Vanderzee Critical Engine, what Bowens describes as "a second generation Babbage-inspired processor constructed in 1878." Bowens notes that, "Vanderzee refined the design and used it as the 'brain' component on nearly all of the intelligent automatons he created and built in subsequent years." Prominent among those creations was Ian, an IA biped designed to find and retrieve æther resources in the tunnels and catacombs below London. Ian can be seen in the background of the photograph standing next to a grandfather clock. Also displayed on the table is a heavy stock Hawkins Æther Repulsor. Firearms Curator Devon Gillroy informs: "The Repulsor was designed by Geoffrey Hawkins and constructed at the Hawkins Industrial Laboratories in early 1881. It was only one of its kind and Hawkins retained it in his personal arsenal for nearly two decades. It was reportedly damaged beyond repair during the Battle of Silver Mountain in 1899." An unidentified optical instrument, likely belonging to Timothy Deakin, rests on a small table in the right background of the photograph. A matching negative of the photograph was found in the Deakin Archive and catalogued as Negative DA1882-01. 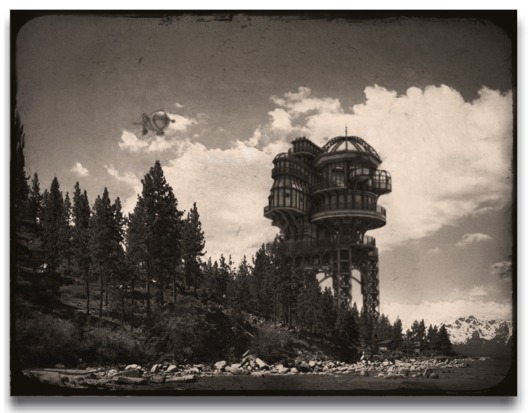 Photograph DA1896-027: The airship Iron Zephyr on approach to the Zephyr House. 19 October, 1896. The Zephyr House was the American base of operations for the Society of the Mechanical Sun and also served as a home for Geoffrey Hawkins during the final few years of the 19th century. It was an architectural marvel designed by Hawkins and Falynne Hyperion, rising above the eastern shore of Lake Tahoe on land that was part of the Ainsworth family's Timberjack Ranch. The Zephyr House is showcased in three amazing photographs recently discovered in the Deakin Archive and now presented here as part of our online exhibition. 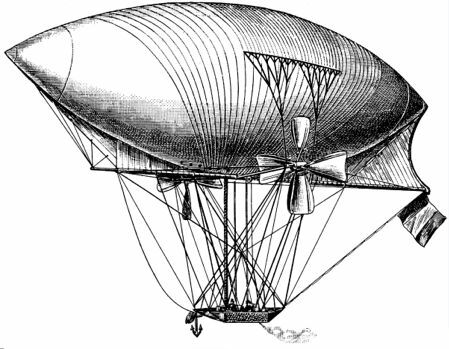 In 1895, Falynne Hyperion moved her airship engineering laboratory from England to Nevada, primarily to escape the industrial espionage perpetrated by jealous European rivals, most notably Ferdinand Von Zeppelin. 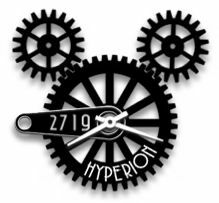 Nevada rancher Giles Ainsworth (and uncle to Society member Berkley Vanderzee) provided a large tract of land on his Timberjack Ranch that afforded Hyperion the necessary privacy to design and construct her fleet of Hyperion Zephyr Airships. At roughly the same time, Geoffrey Hawkins was pursuing Enoch Cyncad across the American continent and he convinced Ainsworth to expand the newly created Zephyr Air Field by adding a large estate that could serve as a strategic headquarters for the Society. Construction of the Zephyr House was completed during the summer of 1896. While there are no existing records that provide specific architectural details about the imposing iron and steel edifice, we do know that the design included electricity via an early prototype hydroelectric generator, two elevators, a wireless telegraph and a high altitude dock to accommodate airship traffic from the nearby Zephyr Air Field. Photograph DA1896-028: The Iron Zephyr docked at Zephyr House. 19 October, 1896. 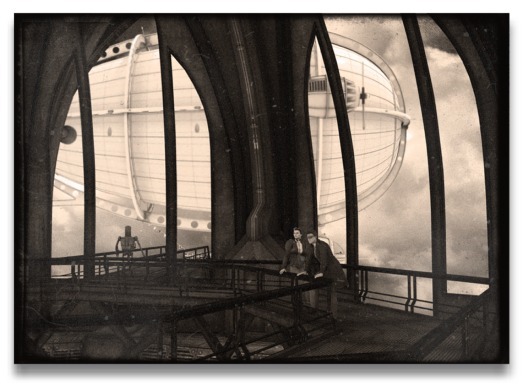 On 19 October, 1896, photographers Jack and Timothy Deakin documented the maiden voyage of Falynne Hyperion's semi-rigid airship, the Iron Zephyr, as it approached and docked at the Zephyr House. Photograph DA1896-027 was taken by Jack Deakin and provides a spectacular panorama of the structure from the nearby lakeshore. The Iron Zephyr can be seen approaching in the distance. With photograph DA1896-028, Jack Deakin captured another impressive vignette, pointing the camera up from ground level as the airship was tethered to the house dock. 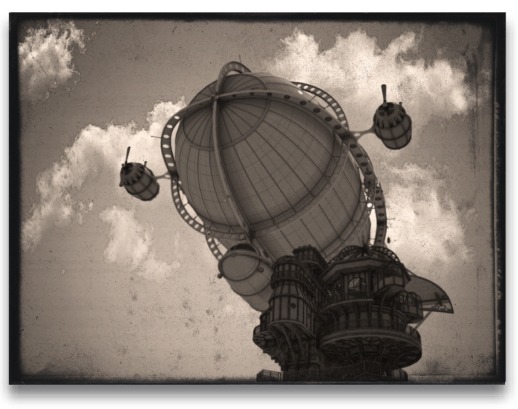 Photograph DA1896-029: The Zephyr House airship dock. 19 October, 1896. The final photograph, DA1896-029, was taken by Timothy Deakin and presented an interior view of the house's airship dock. 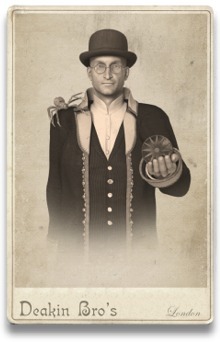 Shown in the photo are Geoffrey Hawkins and Falynne Hyperion. In the background, a servant IA (intelligent automaton) can be seen approaching the tethered Iron Zephyr. The Society maintained use of the Zephyr House into the 20th century, but it was largely abandoned following the disappearance of Geoffrey Hawkins in 1911. The elevators were eventually removed, making the remainder of the building inaccessible from the ground. It became something of a curiosity to Lake Tahoe tourists over the next two decades. In the mid-1930s, eccentric millionaire George Whittell Jr. purchased a significant amount of the Ainsworth family's Timberjack Ranch lakeshore properties including the Zephyr House. In 1942, Whittell had the remains of the building demolished and donated the scrap iron and steel to the war effort. 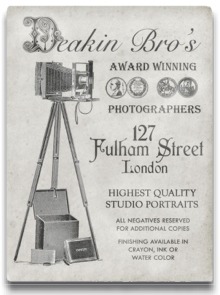 The Deakin Bro's London studio at 127 Fulham Street. 1885. Courtesy of the Deakin Archives, Mifflin University. The focus of our online exhibition is most certainly the Hawkins Strongbox and the fascinating and often enigmatic items contained therein. 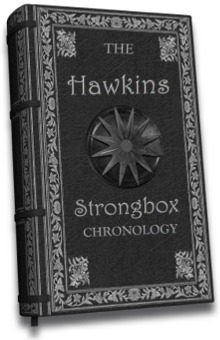 But what we have discovered frequently over the course of the last eight years is that there are many, many resources beyond the Strongbox that also document the lives of Geoffrey Hawkins and his associates. After deliberation with our sponsors at the Victorian Mechanical Museum, we have decided to showcase items that, while not originating in the Strongbox, relate directly to the histories revealed and studied here thus far. 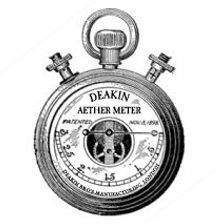 Foremost among these recent discoveries is the Deakin Archive. The archive is part of the Mifflin University Library Archives and Special Collections. It is administered and curated by Matthew Alexander, who is a direct descendant of Timothy Deakin. In October 1962, twenty-three nondescript cardboard boxes were found at an estate sale in Munhall, Pennsylvania. The boxes were filled with an enormous number of photographic negatives, prints, daguerreotypes, cabinet cards and other miscellany that appeared to date back to the Victorian era. They were discovered by Gabriel Sherman, a librarian at the nearby Carnegie Free Library of Duquesne. Sherman almost immediately recognized the value of his discovery and transferred the boxes to a storage room in his library's basement, where he planned on cataloguing the contents. 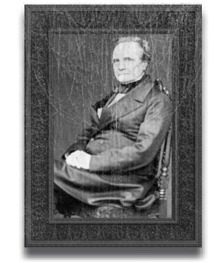 Just mere weeks after his acquisition of the materials, Sherman died of a fatal heart attack. He had not shared his discovery with anyone and his initial research notes on the collection were clumsily mixed into one of the boxes by indifferent library staffers. The boxes were subsequently relocated to a remote corner of the storage rooms and forgotten. 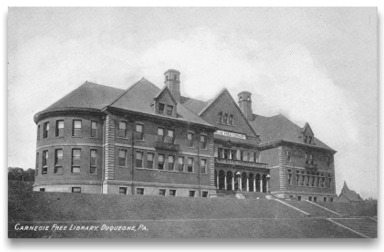 A few years later, the library was sold to the Duquesne School District which in turn demolished the building in 1967. Prior to its demolition, many of the library's assets were deemed unusable by the school district and were donated to the nearby Mifflin University Library System. Unfortunately, the collection was relegated again to storage where it went unnoticed for nearly thirty years. The boxes were rediscovered in 2007 by a Hunter Schwab, a librarian conducting an inventory of undocumented assets. 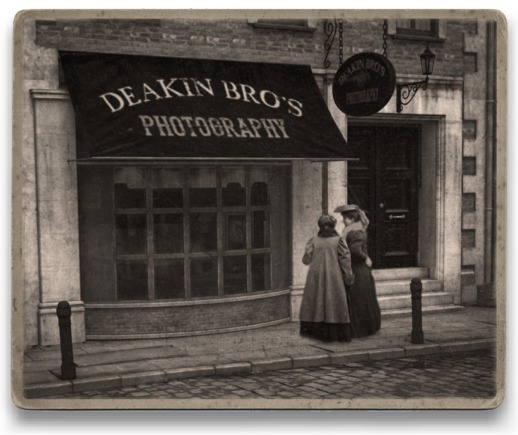 Schwab was intrigued by what he found and noticed that most of the materials were associated with the name Deakin and the Deakin Bro's Photography Studios. By fortuitous coincidence, Schwab happened to be a close personal friend. 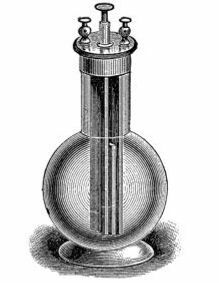 When describing the collection contents to me, I noted to him that my maternal lineage was Deakin and that my great-great grandfather was a rather renown scientist and inventor. 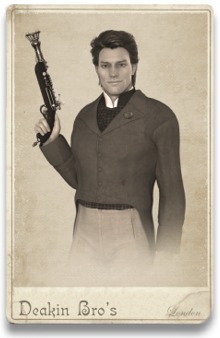 Scott immediately invited me to examine the materials and we quickly verified the connection to my family lineage. I have since spent the last ten years cataloguing and digitizing the collection contents. Alexander found Sherman's original notes and was able to piece together the chronology of events he has here described. He discovered our online exhibition in late 2015 but was disappointed to see that it had not been updated for a number of years. 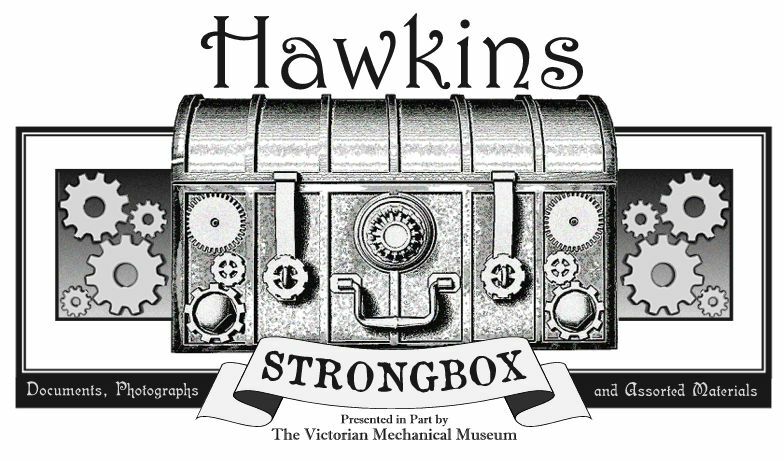 He described his new awareness of the Hawkins Strongbox as revelatory and was anxious to share his own discoveries with both myself and the researchers at the Victorian Mechanical Museum. The collection is especially notable in that many of the photographs include notes and annotations, providing descriptive details and identifying individuals and locations. 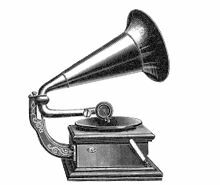 Items date from the Victorian era to the mid-twentieth century, and feature places that stretch from Great Britain to locations scattered all across North America. Needless to say, the archive has become an invaluable asset to the Hawkins Strongbox research team. With the Hawkins Strongbox exhibition now restored to ongoing publication, we will very soon be sharing content from the Deakin Archive, courtesy of Mifflin University Library Archive and Special Collections.